Dressing The Snow | When Do They Serve The Wine? We all need to work together to dress our snow people, right? It takes a village. I don’t think I will be out in the snow today, creating a snow person. I am not a big snow advocate, except to sit inside and marvel at it. And we do not have little children in the house anymore–they are often the instigators of outside snow activity. But I applaud those who do venture out in the cold and create. 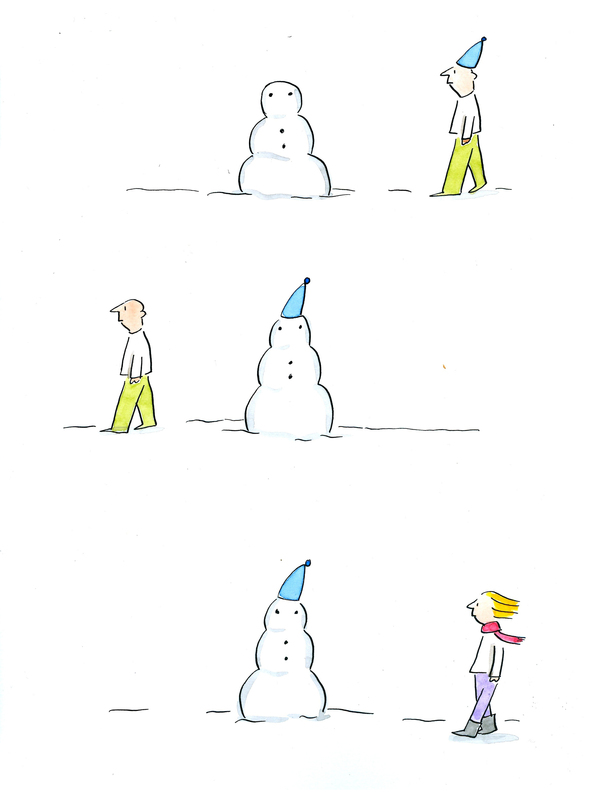 My job is to watch them and put it down on paper–in fact I have done a lot of snow cartoons over the years, it is a great theme for humor. Humans doing sometimes silly things, or reacting to adverse circumstances. Like our NYC Major, Michael Bloomberg. Now, that’s someone I would like to see crafting a snowman. This cartoon originally appeared on revolvingfloor.com, titled Sartorial Considerations. This entry was posted in Random but Relevant and tagged Clothing, cooperation, Mayor Michael Bloomberg, New York City, NYC, revolvingfloor.com, snow, Snowman. Bookmark the permalink. 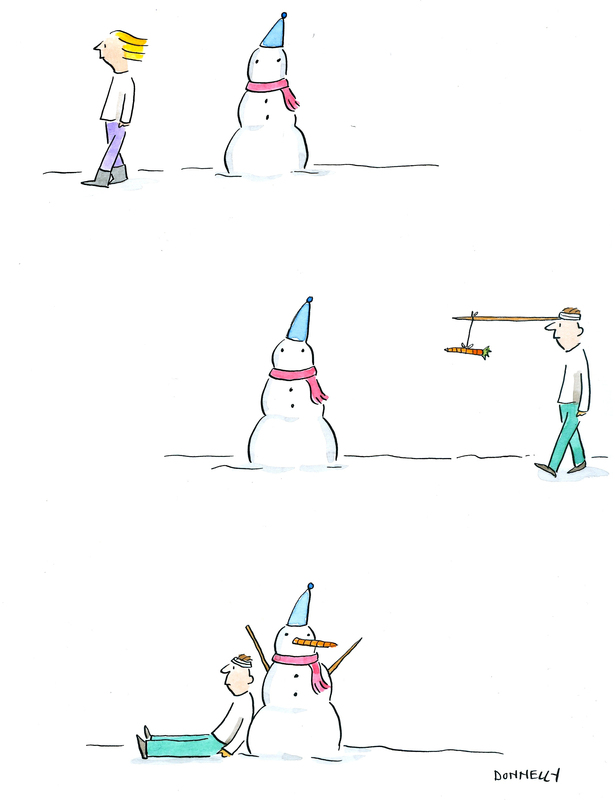 I like how the snowman gives respite to the man chasing the carrot. Delightful. Makes me smile. So amazing that with just a few, subtly-drawn lines, the faces of your characters “express” just the right attitude to convey the cartoon’s sentiment. Loving watching your blog unfold. Thanks very much! That’s very nice to hear, and I hope I can continue to amuse and interest you as I move forward!